There are times when blended drinks seem like more of a hassle than they are in reality - just ask any bartender who rolls his eyes when you order another round of Strawberry Daiquiris. Yet, frozen drinks are actually quite easy and require just a little more effort than shaking up any other cocktail. If you can push the button on a blender, then you've got this. How Easy Is It to Whip up a Blended Drink? Liquor: Often tequila or rum, though vodka's a popular option. Liqueur: Many margaritas and daiquiris require a single liqueur to accent the main flavor. Triple sec (or another orange liqueur) is used most often. Fresh Fruit or Juice: It's summer so take advantage of the freshest produce of the season and learn how to prepare it quickly. Juicing most fruits, particularly citrus, is very simple and many fruits need to simply be cut into chunks so they fit in the blender where the blades finish off the job. Ice: You can't have a frozen cocktail without it, so have plenty of fresh ice on hand. Once you have your ingredients laid out on the bar or kitchen counter, toss it all into the blender, secure the lid, and hit the button. That's it, really! The cocktail recipes below are among the absolute best frozen cocktails you will mix up. There are no exotic ingredients to hunt down, no special tricks, and no fluff or fuss. They are simply great drinks filled with fresh flavor that you can blend up in less than five minutes. 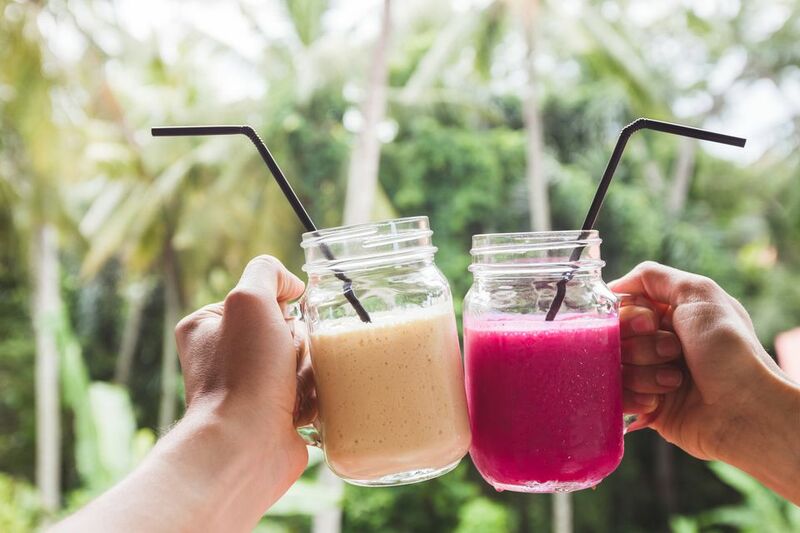 For all of those reasons, the recipes in this list are among the most popular of the thousands of blended drinks you will find. They have been quenching the summer thirsts of drinkers for years and are the perfect introductions to frozen drinks. Once you perfect your personal blending technique (and everyone has one or two tricks), build off these recipes and have fun experimenting with ingredients. Toss in a new fruit, add a splash of juice or a bit of spice, switch out the liquor; whatever you want to do. By the time everything gets whirled together in a blender, it's hard to make a really bad drink, so have fun with it. What You Need: Tequila, triple sec, lime juice, and sour mix. 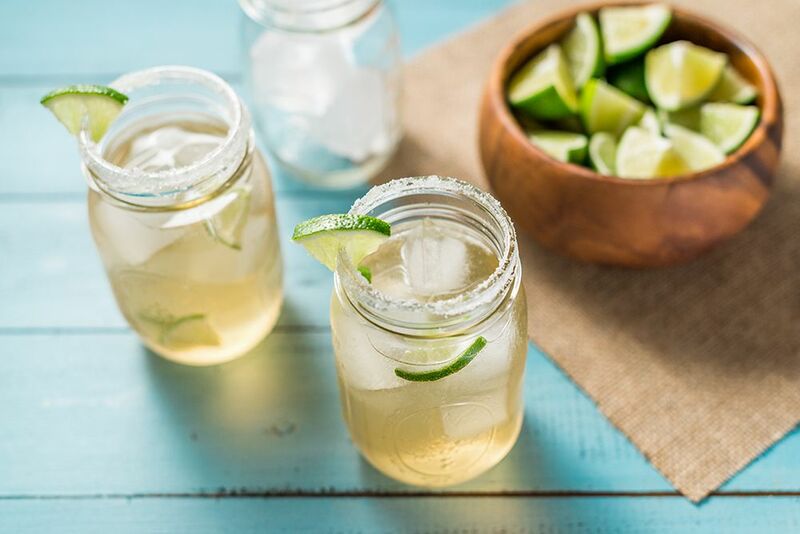 The basic Margarita is very simple and it features the refreshing flavor of the lime juice. This is the foundation for all other margarita recipes, so it's the perfect recipe, to begin with. What is sour mix? Quite simply, it's a sweet and sour syrup that is used as a mixer for a variety of drinks. The best part is that sour mix is unbelievably easy to make at home. All you need is sugar, water, and either lemon or lime juice (or both). It will save you a lot of money from store-bought brands and is a handy mixer to have in the bar. What You Need: Rum, lime juice, and simple syrup. Tequila, not your thing? Not a problem, because the frozen Daiquiri has the same flavor as the Margarita, but it switches to a rum base. The frozen Lime Daiquiri is another summer classic. It is refreshing, sweet, and just a little tart. Quite simply, it is the original Daiquiri tossed into a blender. If you want to be a frugal Daiquiri drinker (and there's no reason not to be), then you need to make your own simple syrup. Do you have sugar, water, a stove, and a pan? If so, then you're 10 minutes away from having a fresh syrup for less than $1 a batch and you will quickly realize how useful it is in the bar. What You Need: Light rum, triple sec, lime juice, sugar, and strawberries. Daiquiris are always better with fresh fruit and the Strawberry Daiquiri is the most popular daiquiri recipe. It's difficult to resist the mix of sweet berries and rum, especially during the dog days of summer. Few experiences are more enjoyable than picking fresh strawberries out of the garden and blending them up with your favorite rum. If you don't have a garden, head to the local strawberry field and pick your own or check in with the vendors at the produce or farmer's market. Whatever you do, save the frozen strawberries for winter daiquiris and margaritas. Summer is the time to enjoy this cocktail in its freshest form! What You Need: rum, pineapple juice, coconut cream, and lime juice. The fourth drink that is absolutely essential for any blender enthusiast is the Pina Colada. There is no doubting that as a fact and it's hard to find any adult who will turn down this boozy tropical smoothie of pure deliciousness. Sadly, each of these top four cocktails has been corrupted over the years. Marketers realized that they are so popular that they had the brilliant idea to dumb it down and create ready-to-drink versions. Yet, if you look at the ingredient list, there's no need for that! If you learn to make a good colada from scratch you will thank yourself. Your friends will thank you, too. What You Need: Tequila, tamarind nectar, pineapple juice, and lime juice. Now that we have the basic frozen drinks out of the way, it's time for some real fun! Though these last drinks may not be as popular as the first, they have quickly risen to the top ranks for a very good reason: they're fantastic. The Tamarind-Pineapple Margarita is an exotic taste of the tropics in a single glass. It is, without a doubt, one of the best margarita combinations you will find. Tamarind has a sweet-sour taste that can be described as something like a lemon-infused apricot. It's unique and adds pizzazz to any cocktail it's mixed into. Two of the best flavor pairings for tamarind just happen to be tequila and pineapple, which is why this is the perfect margarita recipe. Don't let an exotic-sounding ingredient like tamarind nectar scare you off. It's actually rather easy to find at most major grocery stores, just look in the juice or soda aisle. What You Need: Vodka, blue curacao, cream of coconut, pineapple, and ice cream. It's blue, it uses ice cream, and there's vodka... what more could you want? The Chi-Chi is one of the best frozen vodka cocktails and it is a ton of fun for any summer party. Why is the Chi-Chi so great? Essentially, this recipe is a take on the Pina Colada. It has that delightful pineapple-coconut combination, it simply has more of a tropical look, which makes it a poolside favorite. Besides that, blue cocktails are fun, plain and simple! The Chi-Chi is just as easy as any other drink on this list. It also brings ice cream into the mix, which gives it more of that creamy, smoothie-like texture. Oh, and if you like, go ahead and switch to a coconut vodka. It's delicious! What You Need: Coconut and dark rums, banana liqueur, grenadine, banana, and orange and pineapple juices. While this may not be the recipe with the fewest ingredients, it is still just as easy. The biggest challenge will be collecting the liquors, but even that is not an issue. Simply add a coconut rum like Malibu, a dark rum like Trader Vic's, and a banana liqueur like 99 Bananas to your liquor store shopping list. The Rock Lobster is worth that little bit of effort and it's not like spirit shopping is a horrible experience, anyway. Once you have all of your ingredients gathered, you will blend everything except the dark rum until the mix is nice and smooth. Pour it into the glass, ​add a rum float, and the fanciest tropical garnish you feel like constructing. One taste and you will discover why so many drinkers love the Rock Lobster. Bonus points if you drink it with the B-52's playing in the background! What You Need: Tequila, triple sec, watermelon, and lime juice. What is the iconic fruit of summer? The watermelon, of course! There is no reason to pass by this blended beauty when you're seeking out the best drinks of the season because fresh watermelon is everywhere. Once again, this Watermelon Margarita recipe is very easy. It builds on the basic frozen Margarita above and simply adds chunks of juicy melon. You will quickly find that the Watermelon Margarita is as useful as it is delicious. Do you have melon left over from the weekend cookout? It will disappear quickly if you start adding it to the blender. This recipe also works with any type of summer melon. You can even do a melon medley if you like. What You Need: Tequila, triple sec, strawberries, pineapple, and sour mix. We'll wrap up our fruity, frozen delights with one of the best fruit combinations and a quick mental trip to the islands. It is time for a Hawaiian Margarita and you will quickly realize why this drink ranks on this list. Pineapple and strawberry: it is a flavor combination that was created in fruit heaven. As you may have noticed, they are also two fruits that are perfect for the blender. Preparing both fruits is very easy and with just a few cuts, you'll have perfect blender-sized chunks. This is probably also a good time to talk about the quality of liquor in your frozen cocktails. To be honest, you don't have to pull out your best rum or tequila for these drinks unless you really want to. Instead, pick up a decent bottle that is in a budget-friendly price range. The fruits and ice will do a good job of covering up any imperfections in the spirit and you can save the good stuff for fancy, non-blended drinks where quality really does matter. What You Need: Dark rum, coffee liqueur, creme de cacao, cream of coconut, and milk. Frozen cocktails are not all about the fruit. It's only right that to finish off this list with the sweet, boozy smoothie known as the Bushwacker. For this recipe, skip the fruits entirely and indulge in the irresistible combination of coffee, chocolate, and coconut. Back that up with a little rum and toss in some milk for a perfectly light creaminess, and a great drink is born. The consistency of the Bushwacker is more like a milkshake (without the ice cream) than an ice slushy. That makes it a nice change of pace that will keep your summer from becoming too routine.